Xploritall got a sneak peak at the latest and greatest snowsports gear unveiled at the SIA Snow Show in Denver. We will be posting Gear Spotlights on some of the best products we saw. Most products won't be released until Fall 2014. One great product we saw at the SIA Snow Show was the Snowmule pack, fresh off of winning a gold medal at the ISPO sports product show. The idea of the Snowmule pack is to make a day at the resorts with your kids more enjoyable. 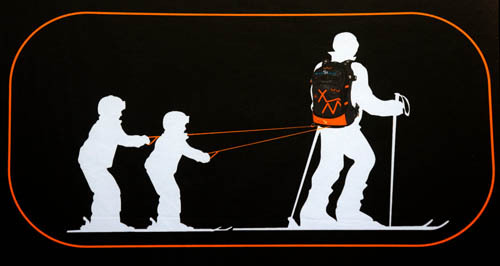 The inventor, Kevin Stevens, could not find a solution to the problem of having to push and pull his kids around on the snow while also trying to carry all of their gear. So he created a pack that has pockets and attachments to stow their poles, skis, goggles, and helmets. But the most unique feature is the dual towing handles that retract when not in use, allowing the wearer to pull two children behind. 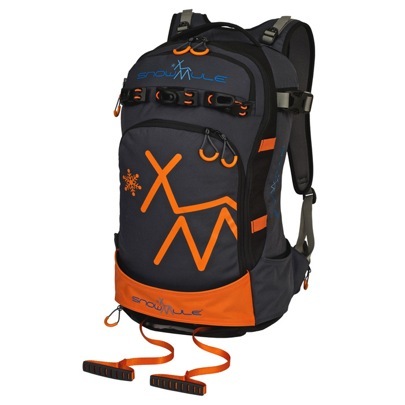 The pack comes in 15L and 25L versions. The idea is a win-win for families hoping to enjoy skiing vacations with small children. As Kevin Stevens told me, if the kids are happy, mom and dad are happy.